A threat to market well-functioning is parties’ ability to strategically default on their obligations. In general, contractual defaults occur either out of necessity or for strategic reasons. Empirically, however, it is challenging to distinguish defaults that occur because the defaulting party cannot execute the contract, or because it does not want to.1 This challenge makes it difficult to study the impact of poor contract enforcement on markets and to design better contracts and policies, particularly in the context of international transactions and in developing countries where formal contract enforcement is weak or absent altogether (e.g. Antras 2015, Djankov 2003). How prevalent are instances of strategic default? How large are the inefficiencies caused by strategic default? We study pre-financing agreements in the international coffee market. Coffee – the most valuable agricultural export for several developing countries – is the primary source of livelihood for approximately 25 million farmers worldwide. We use confidential data from a lender specialised in working capital loans. The structure of the contract is as follows (see Figure 1). Before harvest begins, coffee mills sign forward sale contracts with foreign buyers that import coffee. The lender then advances funds to the coffee mill, backed by forward sale contracts. During harvest, the mill uses the loan to source coffee from farmers and process it. The mill executes the forward sale contract by delivering coffee to the buyer after harvest. The buyer then directly repays the lender upon receiving the coffee. We obtained detailed information on nearly a thousand loans extended by the lender to 272 coffee mills in 24 countries. We first test for strategic default. Strategic default occurs when market conditions change sufficiently to place a business relationship outside its self-enforcing range (Baker et al. 2002). In deciding whether to deliver the coffee according to the forward sale contract or default, the mill trades-off immediate financial gains against losses in the future relationships with the buyer and the lender. There are two types of forward sales contracts. In fixed price contracts the price of coffee is fixed at the time parties sign the agreement. In differential price contracts the price eventually received by the mill tracks the world spot market price at delivery. If spot prices at delivery are much higher than anticipated at the time of contracting, a mill on a fixed price contract is tempted to default and sell the coffee to a different buyer for a higher price. A mill on a differential contract, instead, would not face such temptation. 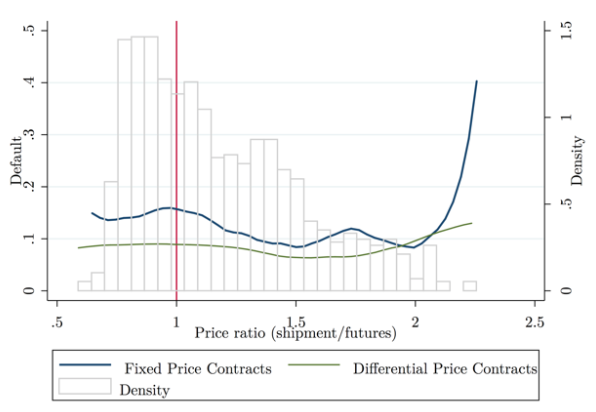 Accordingly, Figure 2 shows that, following unexpected increases in the world price of coffee, mills are more likely to default when they have signed fixed price contracts (but not if they have signed differential contracts).2 Our (conservative) estimates imply that between 42% and 59% of the defaults observed on fixed price contracts are strategic. Our estimates reveal that strategic default causes significant output distortions: the median (mean) mill production would be 19.7% (15.8%) higher if contracts were perfectly enforceable. About a third of exporters are insurance constrained, another third are credit constrained, many severely so – indicating that working capital is far from being efficiently allocated in the industry. These distortions at the export gate imply output losses which in turn, translate into lower prices paid to coffee farmers. Our estimates suggest that welfare losses for farmers could range between 10% and 32%. Our findings suggest that lack of contract enforcement can have significant costs. What can government do? The general spirit of our results is that reducing contracting frictions could yield large payoffs. Still, we would like to advocate in favour of a context-specific, ‘one does not fit all’ approach to policy recommendations to be drawn from our analysis.4 More specific policy implications, however, can be drawn for developing countries aiming at improving exports, particularly in agricultural chains. Many developing countries heavily rely on export revenues generated in few, highly volatile, mineral, and agricultural markets. Our analysis suggests that imperfect contract enforcement reduces both the supply and the demand for hedging tools, even among relatively large exporters. Fostering contract enforcement and strengthening inter-firm relationships along supply chains can yield significant degrees of insurance and expand output.5 Furthermore, strengthening contract enforcement for large exporters downstream might yield large payoffs for farmers upstream. Coffee exporters are, by developing countries standards, very large firms (Hsieh and Olken 2014). As it appears that small and micro firms cannot bootstrap growth, our analysis suggests that it is important to better understand how contractual frictions hamper large firms in other contexts. Antras, P (2015), Global production: Firms, contracts, and trade structure, Princeton University Press. Baker, G, R Gibbons and J Murphy (1994), “Subjective performance measures in optimal incentive contracts”, The Quarterly Journal of Economics, 109(4): 1125-1156. Baker, G, R Gibbons and J Murphy (2002), “Relational contracts and the theory of the firm”, The Quarterly Journal of Economics, 117(1): 39-84. Djankov, S, R La Porta, F Lopez-de-Silanes and A Shleifer (2003), “Courts”, The Quarterly Journal of Economics, 118(2): 453-517. Hsieh, C and B Olken (2014), “The missing ‘missing middle’”, Journal of Economic Perspectives, 28(3): 89-108. Macchiavello, R and A Morjaria (2015), “The value of relationships: Evidence from a supply shock to Kenyan rose exports”, American Economic Review, 105(9): 2911-45. Strategic default is distinct from standard ex-ante moral hazard in which a costly action must be incentivised under conditions of uncertainty and limited observability. We refer to strategic default in the narrow sense of ex-post moral hazard: both forms of moral hazard are strategic in the broader sense of being wilful acts. Relative to standard moral hazard, strategic default has different welfare implications, is differently affected by changes in the environment, and also has different legal implications. The paper address several confounders. Counter-intuitively strategic default is detected on more valuable relationships that sign fixed-price contracts. The risk of strategic default however imposes larger costs on exporters that are (perceived by buyers to be) at greater risk and thus sign differential contracts that are not strategically defaulted against. Our caution stems from the fact that perfectcontract enforcement is not achievable in practice and partialimprovements in contract enforcement have ambiguous effects on efficiency (Baker et al. 1994). Our estimates also confirm Macchiavello and Morjaria (2015) finding that business relationships are valuable.